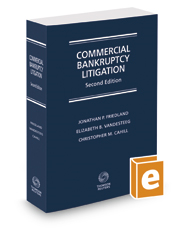 This treatise covers the basics of commercial bankruptcy, the intersection of bankruptcy with other areas of law, and specific types of litigation that arise in Chapter 11 proceedings. The 2019 edition of Commercial Bankruptcy Litigation was just released by Thomson West Publishing Company. This 2,000+ page treatise, with contributions from dozens of top firms across the US, is designed with the non-bankruptcy attorney intended to be its primary reader. The treatise is divided into three sections: (a) "Fundamentals," with chapters covering the basics of commercial bankruptcy; (b) “Intersections," with chapters covering the intersection of bankruptcy law with other specific areas of law; and (c) "Special Focus Topics," with chapters covering specific types of litigation that commonly arise in Chapter 11. DailyDAC / Financial Poise founder, Jonathan Friedland, a corporate structuring and restructuring attorney, is editor-in-chief of "Commercial Bankruptcy Litigation." On the publication of this latest edition, Friedland noted that, "It was a pleasure to collaborate with renowned bankruptcy experts to produce this latest edition, which provides non-specialists with insight into commercial bankruptcy law."